Q: I just wondered what your thoughts are on soy. 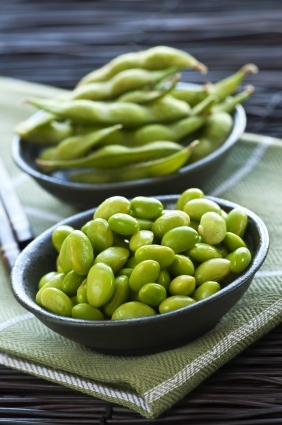 A: Read this well written and researched article at Zen Habits "Finally, The Truth About Soy." Q: I'm having a hard time losing weight even though I am plant-based. Is it because I eat a lot of nuts? A:I'm not a doctor or a nutritionist, but I follow Dr. McDougall's advice. He says "the fat you eat is the fat you wear," and in my experience that has always been the case. Plus the more I think about it, the more it makes sense. If I'm trying to lose fat, why should I eat more of it? Dr. McDougall and Dr. Esselstyn both promote a low-fat/no-added-fat diet for optimum health and weight loss. As soon as I started limiting the amount of added fats in my diet — nuts, seeds, avocados, peanut butter, etc. I lost weight and I've been able to keep it off. Any time I start eating a lot of high-fat foods again, the weight creeps back on. For more information, read The Starch Solution. Also, if you're looking to lose weight, I can't recommend the meal plans enough. We have so many great success stories and testimonials! Q: I've been faithfully following a whole foods, low-fat, plant-based diet since watching Forks Over Knives in April. Today I was looking forward to my check-up with my endocrinologist to hear what awesome cholesterol numbers I had. Come to find out, four months ago my number was 138, today it was 152!!! I know that this is within "normal" range, but still!!! My thyroid-stimulating hormone is also elevated to .1 of the max. There has been no change to my meds, I take them every day at the same time, the same dosage. So is it normal to have an elevation of cholesterol AFTER changing to a plant based diet? A:I'm not a physician so I can't really comment or give medical advice, especially since you're situation is complicated (medication/thyroid removal) and not straight-forward. I recommend talking to your doctor and perhaps a second doctor if necessary. What I can say is I do know one other person whose story might shed some light on your situation. She changed her diet, and her cholesterol lowered so the medication was reduced. Then it was so low the doctor took her totally off her medication — but saying she had to come back in 6 weeks for a test, to make sure things were fine. Unfortunately, her cholesterol had gone up and the doctor forced her to go back on her medication. The woman was even more inspired to try to get off the meds and started trying different approaches and eating a 100% plant-perfect diet. The same thing kept happening. She would qualify to go off, but then once she was off the meds, her cholesterol went back up and she had to go back on medication again. After about a year of this (and her doctor being VERY supportive of her diet and desire to get off meds), her doctor concluded that she wasn't doing anything wrong. Her body just makes too much cholesterol, so she'll have to be on medication no matter what, but the plant-based diet had clearly helped her in lowering the numbers and putting her on the lowest dosage. I think Dr. Essy says in his book,Prevent and Reverse Heart Disease, that there are some patients who will never get off medication, no matter how plant-perfect their diet because of genetics or other factors — but I could be remembering incorrectly. If you're not yet following Dr. Essy's program (it's a bit more strict than what I or FOK recommends), I would also try that and see if it makes a difference. Here is a link to his book. Q: My partner feels that she needs a certain amount of meat and cheese to feel…stable and not spindly. Does this make any sense to you? Do you have any advice for us? A: Watch Forks Over Knives. Humans do not need meat or cheese and both products cause a host of problems in humans (cancer, diabetes, hypertension), even in small doses. Some people don't eat enough calories when they try eating 100% plant-based, because they don't realize that vegetables are so much lower in calories, and that can make them feel a little off, but I find as soon as they eat more calories, and include things like potatoes and whole grains, that goes away and they feel much better than they ever did on their previous omnivore diet. Q: I don't understand why you designate "white" whole-wheat flour. How is this different from whole-wheat flour? A: It's a different type of wheat berries — much softer and better for baked goods. See my post, "Flour — White, Wheat or Gluten-Free" for help.